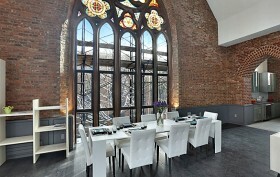 Gothic Revival church turned luxury rental apartment: only in New York. 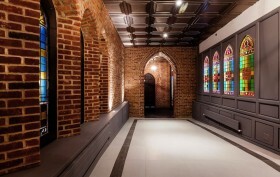 That’s the story behind 232 Adelphi Street, a majestic Fort Greene church built in 1888. It fell into disrepair before being converted into 12 apartments in recent years. This is the last apartment left empty and it’s a pricy one. It’s also big: an 1,800-square-foot duplex with two bedrooms and two-and-a-half baths, all accessed via a private entrance.